There are many different things that come to mind when we think about Monkeys. They are often seen as being cute and highly intelligent animals. There are many different species that have their own characteristics in terms of size, color, location, and even their abilities. They are known for being good care givers to the young and even having some humanistic movements. Monkeys are very vocal animals and that is their name way of communicating with each other. They give of different pitches to warm off danger, to call a mate, and even to communicate with their young. Even though the communication of Monkeys has long been studied, there is a great deal that we still don’t know about it. There are 264 known species of Monkeys in the world. They are often included with Apes but they are very different. The main different is that the Apes don’t have a tail. There are two categories – the New World and the Old World Monkeys. It is believed that they split through evolution approximately 40 million years ago. Monkey Information, Anatomy, Feeding, Communication, Reproduction, Predators, and Conservation. They can be very small animals or very large depending on the species. They can get into mischief quickly both in captivity and in their natural environment. They have forward facing eyes and flat noses. They also have opposable thumbs that help them with climbing and movement. They have fingers that are structured very much like humans. They are known to use tools too such as sticks and rocks. They can even use leaves to scoop water up in and drink. Monkeys are like humans in many ways. For example they seem to explore many of the same emotions within their groups. They can show love, anger, sadness, mourn the loss of loved ones, and even laugh. They can be seen with smiles on their faces which often makes observers wonder what they are up to. Monkeys also have their own unique set of fingerprints just like humans do. This is very interesting and further shows us that we are indeed highly related to all types of primates out there. Monkeys have a brain that is large for their size and it is part of the reason why they are so intelligent. They are believed to be smarter than other primates including Apes and Lemurs. 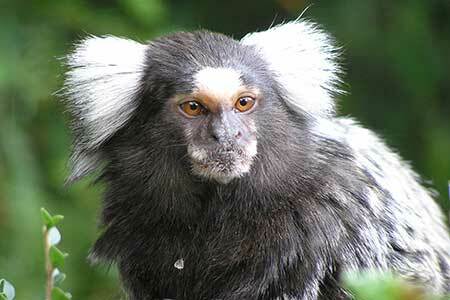 There are 264 known Monkey species. The smallest Monkeys are about 6 inches long and 4 ounces. The largest ones can be up to 3 feet long and weigh up to 77 pounds. The future is uncertain for many different species of Monkeys. The combination of their habitat being taken down and loss of food have taking a profound toll on their populations. Hunting by humans and even them being kept as exotic pets have also resulted in many young being removed from their natural habitat. There are locations where Monkeys are killed because they seem to be a nuisance. Villagers kill them so that the Monkeys won’t eat the crops they have planted. They also consume the meat from the Monkeys in many areas. The intelligence of Monkeys has allowed them to be trained as service animals for the elderly and disabled. They have also been part of elaborate training programs such as going to outer space. Controversy has also stemmed over these primates being used in laboratory experiments. Even with strong conservation efforts in place there is still no way of knowing if many of the different species will have the help they need for ultimate survival. Monkeys do seem to do well in captivity though. This is why they are part of many zoos and conservation locations. People come to see such attractions as Monkeys can be very entertaining. Breeding programs are also part of the conservation efforts. This is to help many of the species get their populations to increase. Hopefully many of them can one day be released successfully back into the wild.